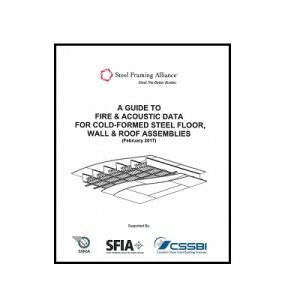 The Steel Framing Alliance (SFA) has published an update to “A Guide to Fire and Acoustic Data for Cold-Formed Steel Floor, Wall and Roof Assemblies.” The document is available for free download. The guide provides an online searchable directory that allows users to browse the current, complete range of fire and sound-rated cold-formed steel assemblies for residential and light commercial construction as listed by Factory Mutual Global Research, Gypsum Association, Intertek Testing Services N.A. Inc., National Research Council of Canada, Underwriters Laboratories Inc., and Underwriters Laboratories of Canada. A new Underwriters Laboratories (UL) section for non-load bearing suspended shaft wall ceilings. Ten obsolete assemblies were deleted. The information was compiled by the Steel Framing Alliance and the Canadian Steel Construction Council. The previous edition of the guide was published in 2013.